Where’s Wallis? 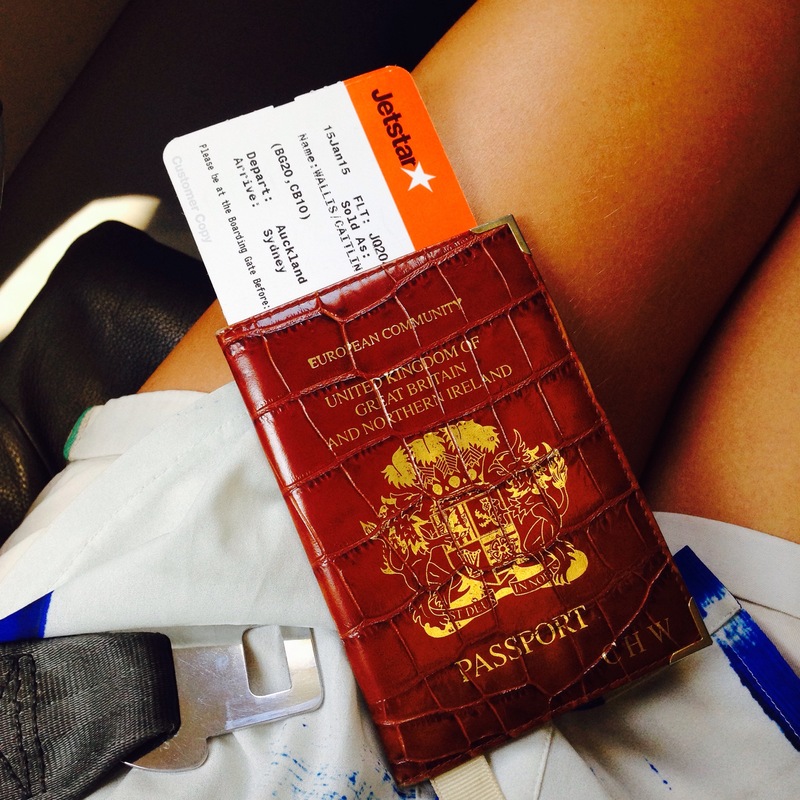 One week in… Sydney, Australia – Where's Wallis? Why helllloooo there, did you think you’d be rid of me once I arrived in Aus? Afraid not!! I’m one week in and it’s been a bit of a roller-coaster! 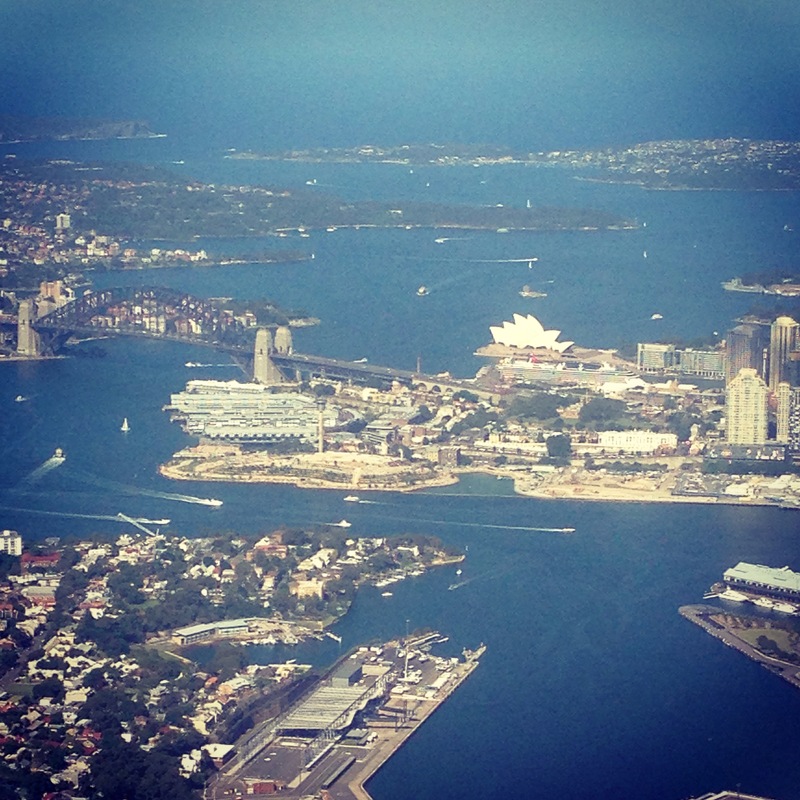 This time last week I landed in Sydney to a fantastic aerial view of the city and navigated my way through the automated passport control. It is somewhat disconcerting that I still don’t have a single thing in my passport to show that I’ve come into Australia, or that I’m entitled to stay here. My friend Hannah from Deloitte in London had kindly said that I could crash with her when I first arrived in Sydney so I hopped in a taxi to her flat in Bondi. I then went to pick up the keys to the flat I’ve now moved into. I’ve moved in with Alec’s (ref California blogs) girlfriend Toots who is a lovely Venezuelan girl who’s lived in Aus the last few years. She had a spare room in a 2-bed flat in North Bondi so it’s worked out perfectly. Toots was away for a long weekend in Auckland with her family (I obviously shared my Auckland expert tips! ), so she’d left the keys at Alec’s old flat with his flatmates – Liam, Steve and Dan. I went over and met them and embarrassingly managed to call Steve “Dan” in conversation. You know when you think you’ve mastered the name of someone you’ve just met. So you boldly decide to throw it into conversation to emphasise the fact that you care, and are interested. But then you say the wrong name. Mortifying. Steve (and Dan) obviously got over it quickly though as they invited me to join them for a day trip to a waterfall that Saturday which I keenly accepted. I got back to Hannah’s about 10pm, which I think was midnight NZ time. The excitement of my arrival and the slightly indulgent few days that Tim and I had in Fiji had obviously taken their toll on me. Hard as I tried to stay awake until 11.30 when Han had said she’d be back, she ended up waking me when she came into her room, Kindle clasped in my hand. It was so lovely to see her after over a year, and we ended up chatting until a little too late. She was then up at the crack of dawn to head to boot camp on the beach. 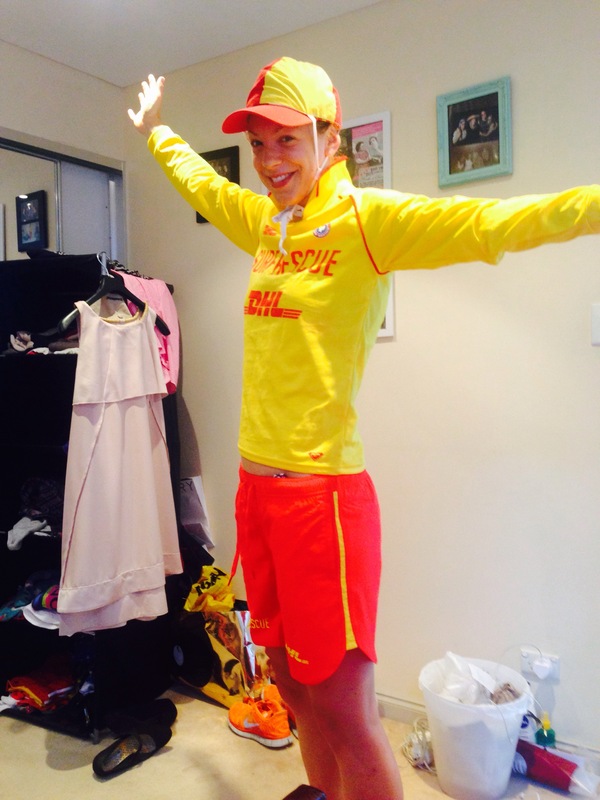 My intro to the Aussie fitness madness. The next morning I did a bit of life admin; got a bank account, got a phone and then went into the city centre for the first time to meet Hannah and Jay (also ex-Deloitte) for lunch. 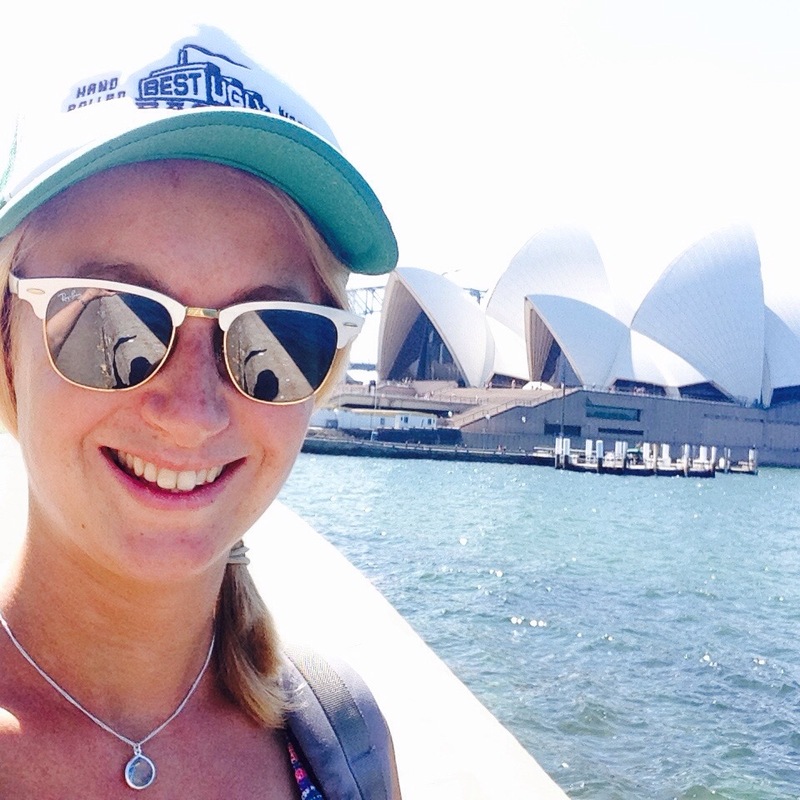 That afternoon I played tourist and went for a walk around the city, through the beautiful botanic gardens and then up to the opera house and harbour bridge where some selfies may have taken place. People had said that Sydney had strict drinking rules but I was surprised when we interrogated entering the bars: “where have you been?”, “how many drinks have you had?” And then I did the classic thing of getting nervous under pressure, plus the fact I genuinely didn’t know the name of anywhere we’d been. 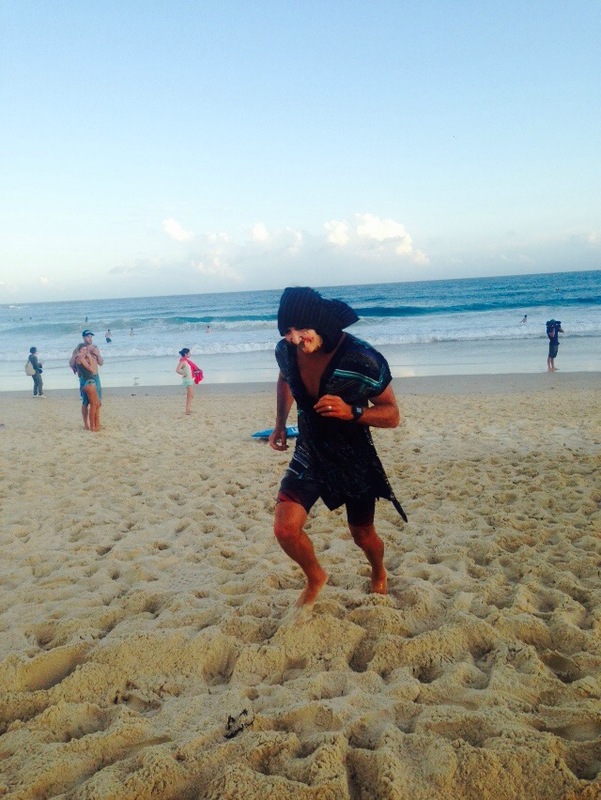 On Saturday Hannah got up at the crack of dawn (again) to go life saving duties down at coogee beach. Wonderful outfit for it! I am really tempted to do the training just to get the gear. It was the day of the waterfall excursion with Alec’s old housemates. Such a great day! 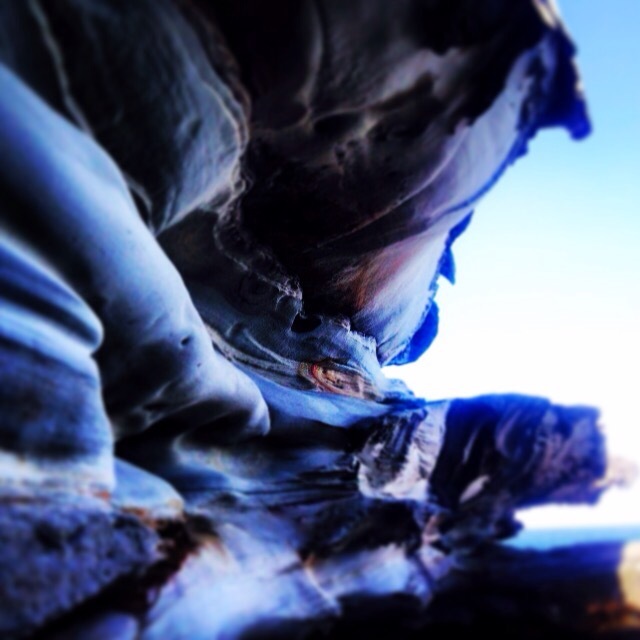 We went to Collin’s beach which is a little hidden cove up past Manly in North Sydney. We drove over the harbour bridge which was very exciting! When we got to the beach, all of the boys had made their way over to a giant rock/cliff out in the bay and were throwing themselves off. We climbed up to the top (I reckon it was a good 5m high) I almost bottled it but you know, new friends to impress! Two jumps was my limit and then headed back to the beach to sunbathe for the rest of the day. We went for drinks in Manly afterwards and then had a slow drive back to Bondi before drinks that evening out in Surry Hills again. I had an early night as the next was MOVING DAY!! I said my farewells at Hannah’s and headed over to Toots’ flat. It took me all of 5 minutes to unpack the rucksack of doom and there I was…all moved in to a flat in Sydney. Hannah asked if I fancied a run on Bondi beach that evening. I didn’t want to take the whole bunch of about 5 keys for the flat on the run, so I just took the building key and the key for the front door. Well, what I thought was the front door key. I tested it before leaving and everything, but I must have just taken the wrong one off the keyring. When I got back to the flat an hour or so later, sweaty, with a wet bikini under my running kit. I was on the phone to my friend Laura from home at the time having an overdue catch up, so I tried to remain calm and continue chatting as I frantically wiggled the key in the lock and (lightly) shouldered the door. No luck, so I confessed to Laura and had a mild panic. Toots wasn’t due back from NZ until the next evening. What are friends for eh? A few hours after I’d moved out of Hannah’s I was back at her door soggy and penniless! I stayed over that night and had to steal her clothes and money for the next day. Her housemates joked that I just couldn’t bear to leave. As I didn’t have any contacts/glasses with me I had to try and navigate my way into town blind. I was asking strangers what number the buses were as they were all of 10 meters away and they looked at me like I was mad! My key purchasing priorities were bike and bed. I lined up 3 “bed viewings” for that evening. The first one was a young Welsh couple who were moving up the coast that week. The bed was fine, nothing special, standard ikea. They were desperate to sell it and it was clear that I was their last resort when they said to me…”well if you don’t buy it I don’t know what we’ll do, we’ll probably have to burn it!” 😂 no pressure then. The second bed was far superior, a wooden ‘sleigh bed’ owned by a girl who was moving to London. I wouldn’t be able to get it for a few days though. Bed 3 wasn’t great at all, but the guy who was selling it was the founder of the Aus equivalent of moneysupermarket.com and was a really interesting guy so we ended up having a beer and chat. In the end I opted for bed 2, so I had a couple more nights on the air bed, and an ikea bed has gone up in smoke as a result of my selfish actions. The next day I had some more errands to do in town, I signed up to Medicare which means that I get cheaper healthcare here if needed, hopefully it won’t be! 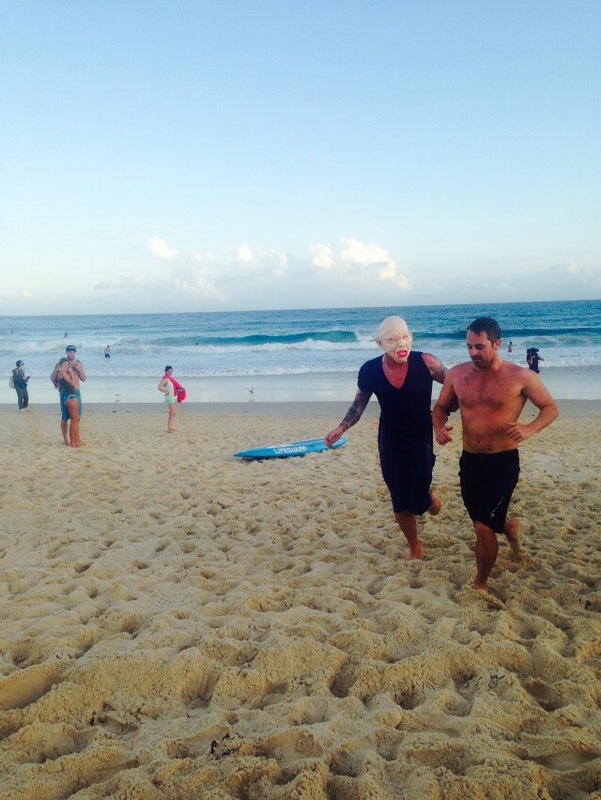 I then went for another run on the sand at Bondi (so difficult!) and then I cooked dinner for Toots and I at the flat. Wednesday I got up at 5am as I was planning to attend my first triathlon session with Coogee triathlon club. 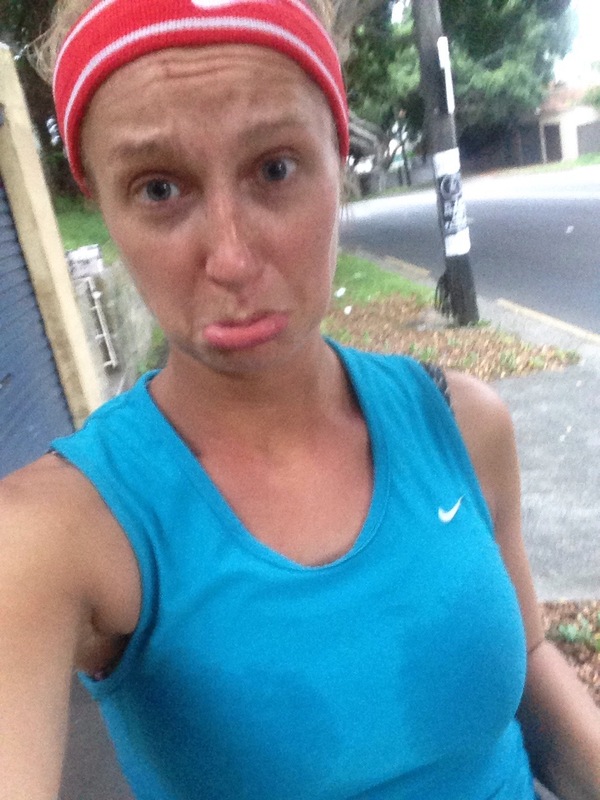 I’d heard about them through a girl called Loren who is a run leader at the Nike running club in Sydney. Loren had offered to give me a lift over to coogee (south of Bondi), and was due to pick me up at 5.30am. So then I was just up from 5am for the day. It’s a really strange feeling when everyone around you is heading off to work, and that’s what I’ve been used to doing for however many years. 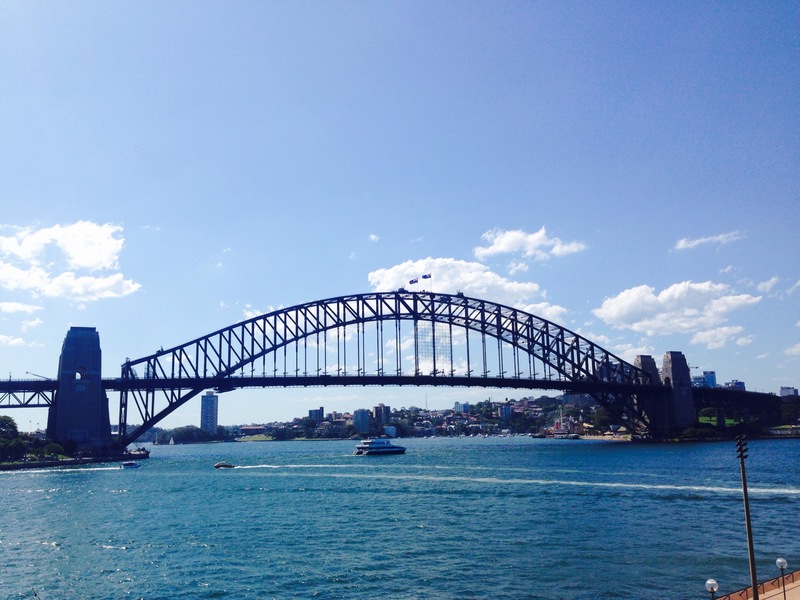 When I was travelling it didn’t feel strange as I always had an itinerary and a plan for ‘where next…’, whereas I definitely have a bit too much time to think in Sydney! I just need to enjoy it and make the most of it and see where it takes me. Later that day I went down to Bondi beach and randomly bumped into a guy I’d met briefly in Fiji. He was setting up the Ben and Jerry’s outdoor cinema by the beach which is definitely on my list of to-dos whilst I’m here. I had a little read on the beach (Monkey Business – funny and honest book about the reality of working in investment banking) and then noticed that an obstacle course was slowly being constructed around me. 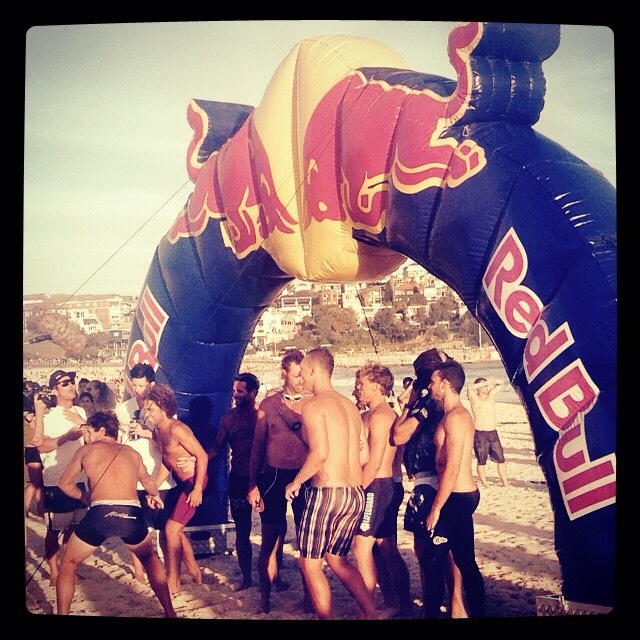 I overheard that this was for the annual Bondi lifeguards race. I was obviously keen to stick around to watch that. Just as the race was about to start there was a real drama right next to me. Three girls were standing there chatting, when suddenly one of them collapsed to the floor, screaming her head off. Her friends looked very confused and were saying “spider? ?”, at which point I shuffled backwards quickly! They called for help and the lifeguards came running over (as did the camera crew who were getting ready to film the race) and it transpired that she had dislocated her knee. I have no idea how it happened as she was literally standing still. The knee was popped back into place, and the girl then seemed okay. The lifeguard who had helped her was asking her about how it happened and then said…”have you had a few drinks today?” to which they all giggled sheepishly. 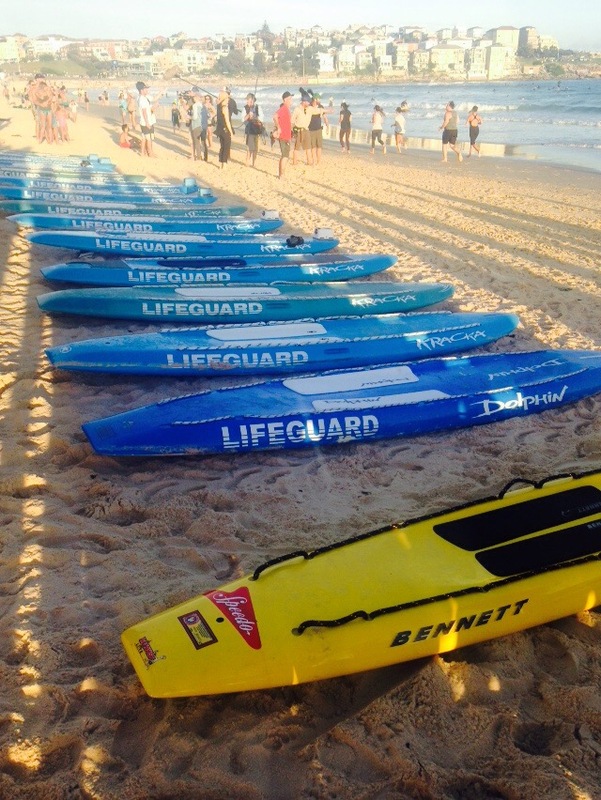 Whilst I’ve never seen it, I’ve heard that the Bondi rescue TV show is very set up. So part of me remained sceptical as to whether the whole thing was staged for the benefit of the cameras. But I’m not sure that you can fake screaming like that!! After all this drama the actual race commenced and it was hilarious. They had to do a couple of laps of running, ending with a flying jump off a boosa ball over a piece of rope about 4ft in the air. Many were unsuccessful. 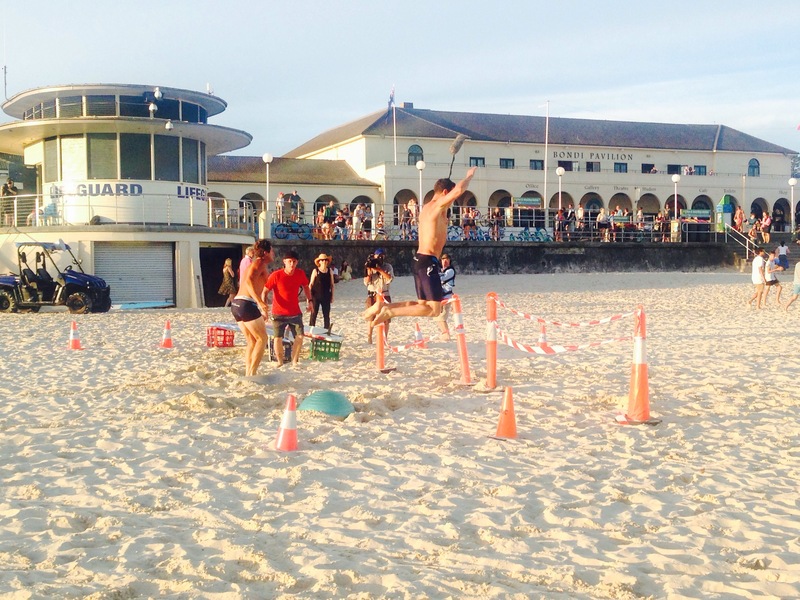 They then did a swim course and then went out to a buoy on their surf lifesavers before sprinting back to the finish. Great fun. The guy who gave me the key was a middle aged Russian man, who when he found out I was from England started singing his praises of British cinema. I discovered that his favourite film is Love Actually, that he now watches reunions in airports, and that it has taught him that you should never shy away from your feelings. An intense but pleasantly surprising discussion for 11am on a Thursday, and I eventually got the key. 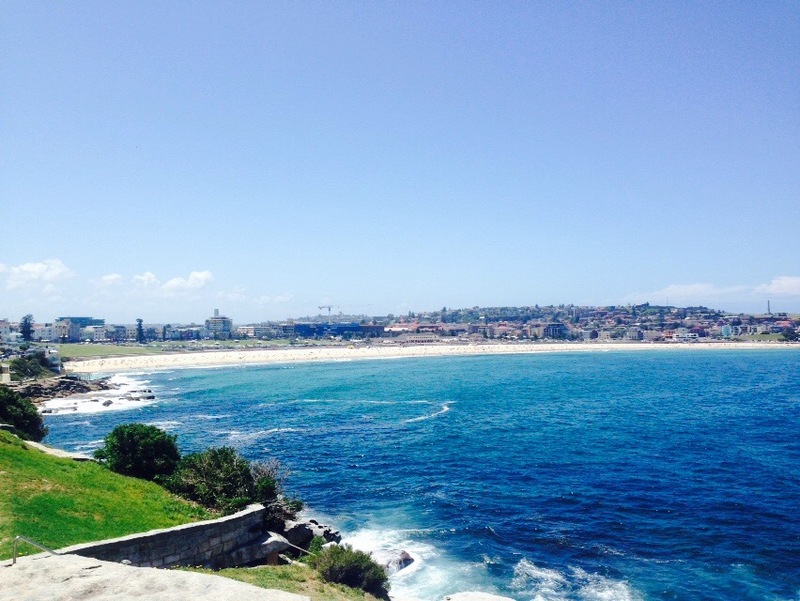 That afternoon I did the ‘Bondi – Bronte’ coast walk with a girl called Lucy who is a good friend of Alec’s sister Nel from back home, and who has coincidently just transferred to Sydney with Deloitte consulting. The walk was beautiful and I was glad to have someone to do it with. 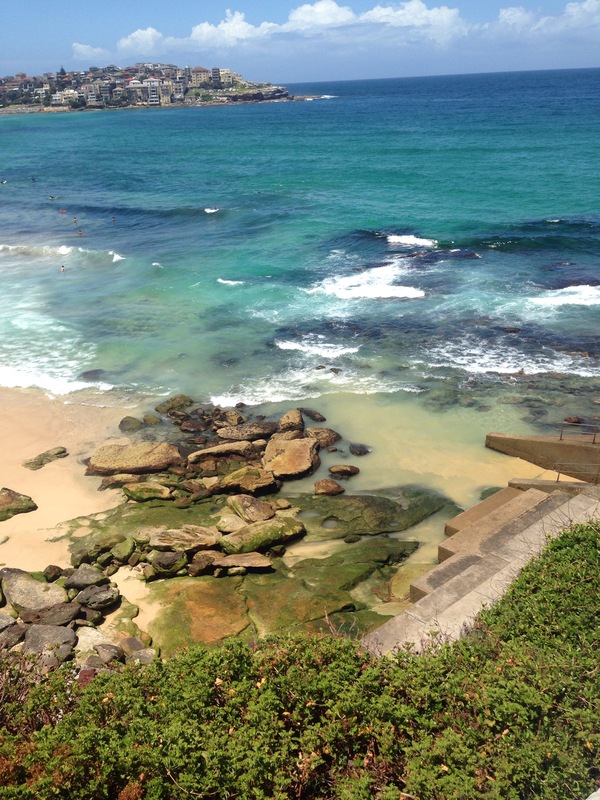 When we got to Bronte we had a swim and a sunbathe and then made our way back to Bondi. I think I’ll attempt it as a run sometime. Maybe once I’m a bit fitter! When I got back to Bondi I met up with Bart (Dutch friend from Fiji, aka kayak lifeguard for our epic island swim) for a surfing lesson. Sadly the waves were not ideal learning conditions, and a couple of times I got totally dumped into the shallows, emerging with seaweed in places it shouldn’t be and my swimsuit not where it should be!! We called it a day after half an hour or so of lesson and went for a swim instead. We then went out for some food and drinks at a bar called Bondi Hardware that I’d spotted earlier in the week, and Hannah’s lovely housemate Laura joined us. – I was annoyed that I’d unwittingly drunk more than intended. I largely blame my unusually vocal nature on Bart for telling me to “be more Dutch” I.e. Direct, and to ditch the English beating around the bush. Despite the fact the end result was not as desired, I was glad that I said something and it’s good for me to practice speaking up when I’m not happy! Regardless of the 2 extra drinks tri-training the next morning was a great success, I loved it! Loren gave me a lift to Coogee and there were about 15-20 others from the club there. We did 6 times swimming across the bay, luckily it was a reasonably still morning, and whilst I was definitely one of the slowest I didn’t hold everyone up for hours, so better than anticipated. There was a great atmosphere and everyone was really friendly. We went for coffee afterwards and I met up with a guy from eBay to try out his bike which I was considering buying. I don’t think I’m going to go for that one, but it was nice to be back on a road bike again! 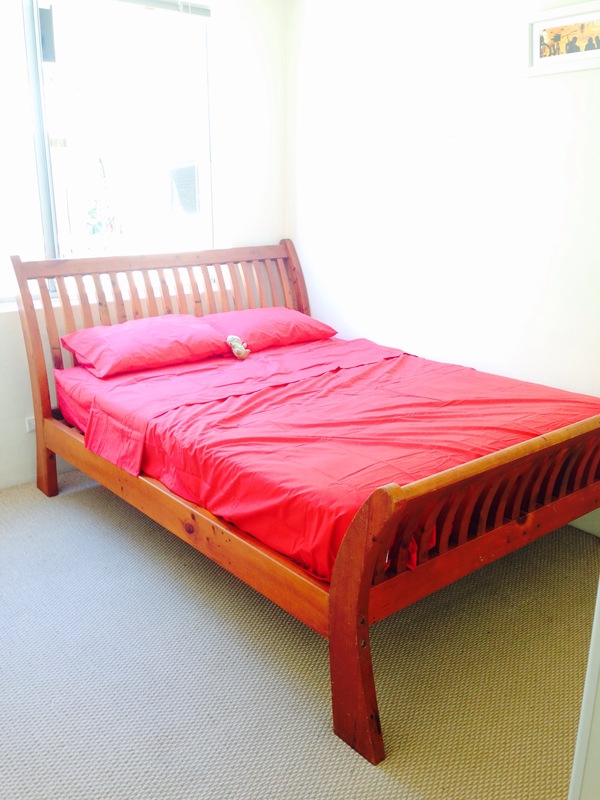 Once I got home I went to collect the sleigh bed. The woman I was buying it from arranged a van and her friend to help us de- and re-construct it. Thankfully it fits in my room. I was unsure whether it would as I used the highly accurate ‘arm span’ unit of measurement when I went to view it. I only got to sleep on it for the first time last night as I’ve been in Melbourne for the weekend (separate post on that!) and it was absolutely dreamy – no pun intended.